When the alarm went off at 4:00 AM, it was race day. 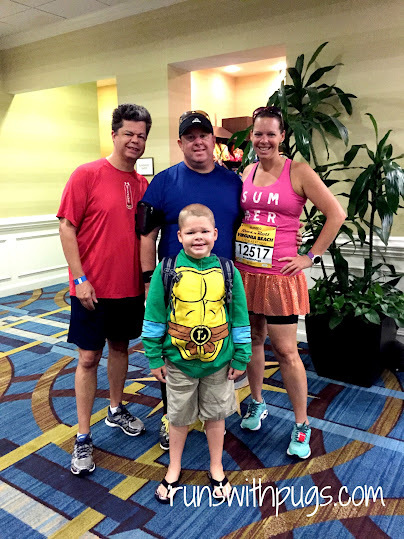 Our plan was to get up and dressed, and then walk, with little man, down to my brother-in-law’s hotel, where we would drop him off with his aunt and cousins and then hop a shuttle to the start line. After saying our goodbyes, we walked across the street to the long line of waiting shuttles. There was no shortage of transportation, and our bus headed off to the convention center with less than a dozen passengers. I can only assume they kept going back and forth until start time. We scoped out a bank of portapotties and a curb, and sat down to wait out the minutes. It started sprinkling and we had to get under cover of a tree. Boo. Somehow, we were on the backside of all the action, so I’m not really sure what was going on as more and more people started arriving. I had to wait on lines for the bathroom twice, and I’m going to be honest: we cut it REALLY close to race time. As in, we were en route to our corral as the National Anthem started. Yikes. That is not at all how I like to do things and I was starting to feel a little anxious. 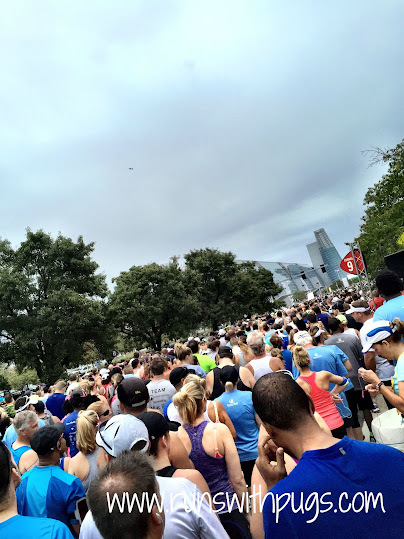 It took us a moment to find our way into the corrals, which had already started moving. We were assigned to 12, and I think we popped into the crush close to where we should have been. A glance around showed that we were surrounded by the same corral number, as well as some higher and some lower. No one really seemed to be paying attention or checking, so we just went with it. It was certainly crowded, but very laid back. Each corral was sent off with some music and good luck wishes, and we patiently waited our turn. I wasn’t thrilled that the rain started up again. However, the precipitation quickly passed and in no time, it was our turn to start. My race day strategy was pretty simple: stay in step with Mr PugRunner. This was his second half marathon and his special request that we run together. I spent the summer training at his intervals of :60/:30 so that my legs would be used to the quicker starts and stops, so we were ready to go. The first four miles of the race were uneventful, except that Mr PugRunner started mentioning that his Achilles was acting up. I was a little concerned, and when we passed the turnoff for the 5K runners, I mentioned that he could turn off and end the race early. He wanted to keep going, and so we we did. The sun was staying hidden, and it was actually a little breezy. The humidity was higher than expected but way lower than back home, and to be honest, I wasn’t even breaking a sweat. In fact, a runner on the course pulled up next to me to tell me that what sweat I did have had formed a heart on the back of my shirt! We wound through some city streets before a long straightaway on Atlantic, parallel to the oceanfront. And then, I pretty much lost track of where we were altogether. There was a point where we hit upon two bridges, a lower one that we had to cross, and a higvher one for the return, which the leaders were already dominating! We kept up with our intervals pretty uneventfully though mile 5, and then Mr PugRunner announced that he needed to break and stretch. We got in about another mile before he had to pull up to walk. He was having pain in both Achilles now, and he just couldn’t shake it. I felt awful for him – it’s a terrible feeling to be hurting and know that your options are to drop out or keep pressing gone, with still half a race to go. He felt that if he just took it easy, he could finish, so we kept moving forward. So we sat back and just did our best to try to enjoy the atmosphere. I insisted that we take a band selfie – the music was great. There were stages roughly every mile and a half, and it was nice to have the live entertainment. I hadn’t even packed my iPod for the race, although I did tell Mr PugRunner that it was ok if he had to plug in his earbuds to help take his mind off things for a bit. He works much better with his music, while I train with and without (I prefer to have my tunes, but I can make do without), so I wanted him to have as easy a time as possible, considering the circumstances. There was a beautiful stretch of wooded area, full of rolling inclines (for us, they were hills, but for everyone else they were wee little speed bumps). 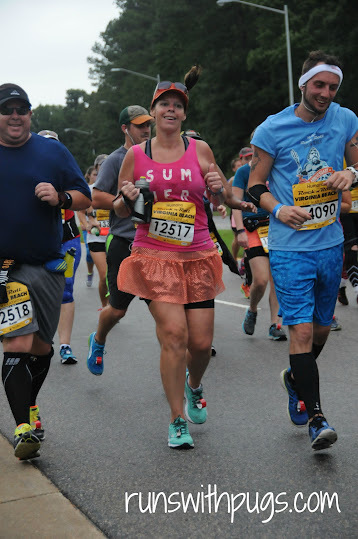 I truly enjoyed all the greenery – it was one of my favorite parts of the whole course and such a nice change from the routes we normally run back home. Right before mile 8, Mr PugRunner had to stop at a Med Tent. One leg was feeling better, but the other was still plaguing him. He explained what was going on and they took note of his bib number and wrapped his ankle with an ice pack. While they were working on him, I noticed that there was a empty portapotty sitting a little ways behind them. I asked if they would mind if I popped in while I waited, and they were very gracious to allow it. 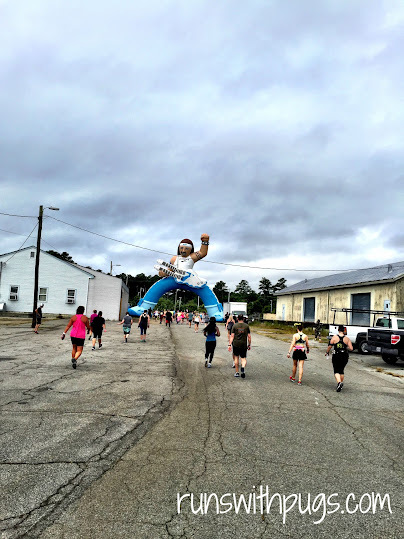 Perhaps the hardest part of the race was when we branched off to run through the military barracks. There was no shade, very little in the way of entertainment (although there were some very enthusiastic cheerleading groups at the end of the area), and aside from small houses and buildings, not much in the line of scenery. We picked up a friend: a young woman who was running (and unfortunately not loving) her first half marathon. She was having some pain and cramping, and we invited her to stay with us as long as she wanted to, as kept alternating between straight walking and intervals. She was game until we got out of the barracks area, and was then worried that she wouldn’t be able to keep up. We got her to the next med tent and advised her to get some salt to help with the cramps, wished her luck and said goodbye. I was so ready to be done at this point, but the spectators and crowd support were starting to pick up again, after the virtual desert of the barracks. We were able to snag cold, wet towels at one stop, and not one, but TWO otter pops! This girl LOVES otter pops during long races. I may have started skipping at that point. I don’t even know. Just after mile 11, we faced the higher of the two bridges from this morning. Fortified by my popsicles, I really enjoyed the view. 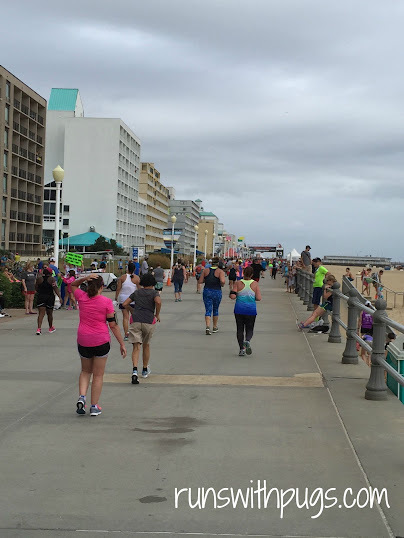 The last mile of Rock ‘n’ Roll Virginia Beach was on the boardwalk along the water. And, oh my, was it the longest mile. We could see the finish line in the distance, but we kept running and running and it never seemed get any closer. At that point, the course was pretty fully lined with cheering spectators, and it was such great and encouraging ambiance. It was really nice to see that even though we were hot and tired, we were still having a great time with each other. But, we still had to stop for our water, snacks, and a picture with this guy. Because he juggled those deflated balls throughout the whole race. We started moving down the boardwalk, to the Beer Garden. The crowd was crazy, but it was worth the wait. And then it was time to walk all the way down to meet up with little man and the rest of our family. We stopped for this picture. And then it was time for food, glorious food! Half marathon number five (for me; number two for Mr PugRunner) in the books! The only, incredibly mild, complaint I could even make was that they didn’t supply Biofreeze at the aid stations. It would have made a world of difference for Mr PugRunner. The volunteer with whom we spoke said a lot of people had asked along the way, so hopefully they would have it for next year. I don’t know if this is something we could run every year (it’s a long trip on a holiday weekend, when little man is already back in school), but I hope we can do it from time to time. I am also excited to check out other Rock ‘n’ Roll events. 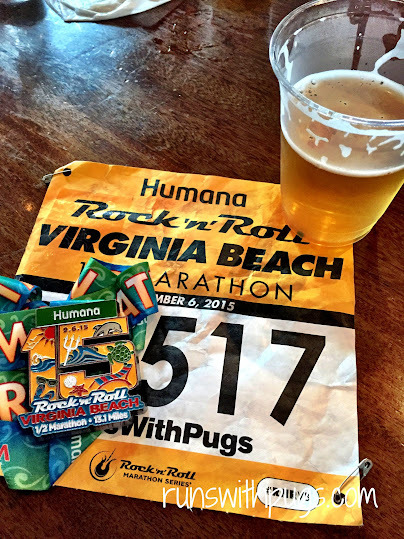 Have you ever run Rock ‘n’ Roll Virginia Beach? What’s your favorite “big name” race? Sounds like a great race and family weekend. I am so impressed with your dedication. I started with couch to 5k and 10k a few years ago and saw so many benefits to running. 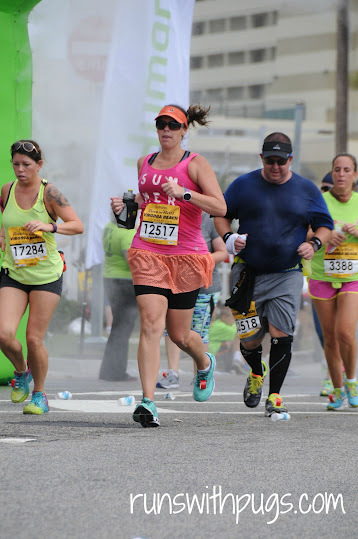 Unfortunately, I let a few injuries and plantar fasciitis sideline me and I stopped running. I’m trying to start over and manage the plantar fasciitis, but it’s hard for me to stay motivated. It’s refreshing to read about your races and training. Thank you! If you ever want to chat about your plantar, please feel free to email me. It is hard – I was sidelined two years ago because of the PF, but even though it pops up from time to time, I keep on going. I hope you are able to get back into running. It stinks when you are hurting and can’t find your mojo. WOOHOO!!! Congrats to you both!! 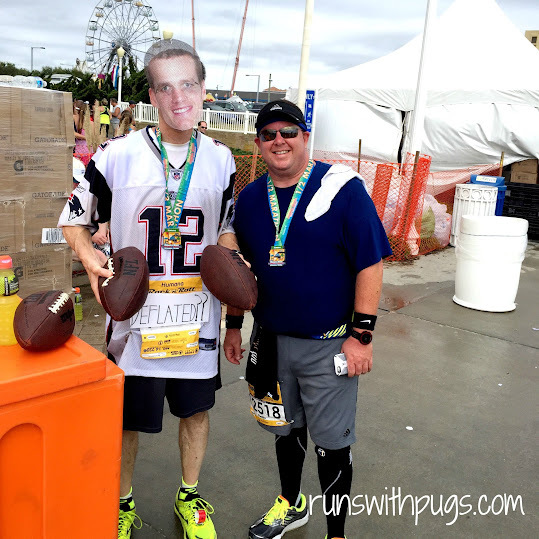 It sounds like you had a tough race, but so amazing that you two stuck together and that Mr. Pug Runner was able to push through the pain. He did really well and it was a much better experience for him than Space Coast the year before. 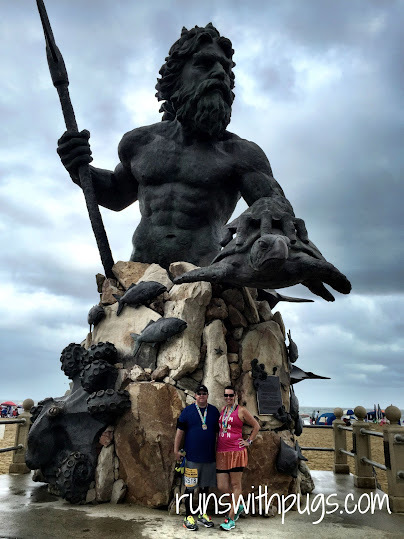 He’s still not in love with the half distance, and I am fairly certain after this year’s Space Coast, he will be stepping down to 10K and under. Poor Mr. Pugrunner! I’m impressed with his fortitude though! Awesome job getting it done, and I love that you stayed together and supported each other the whole time. I had never run a half with anyone like that until this past May. 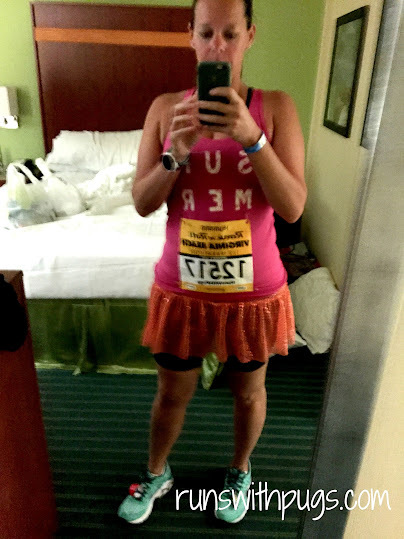 I was not as well trained as I would have liked, and was not prepared for how hilly… no MOUNTAINOUS the course was. But my best friend said she wanted to stay with me the whole time, and it was awesome having someone there through the struggle. I think my favorite big name race is still the Disney Princess half. The only other really big one I’ve done is the NYC half, and it was horribly cold (about 23 degrees at the warmest!) and I don’t remember there being much in the way of cheering crowds. Mountainous is a terrifying word for me. 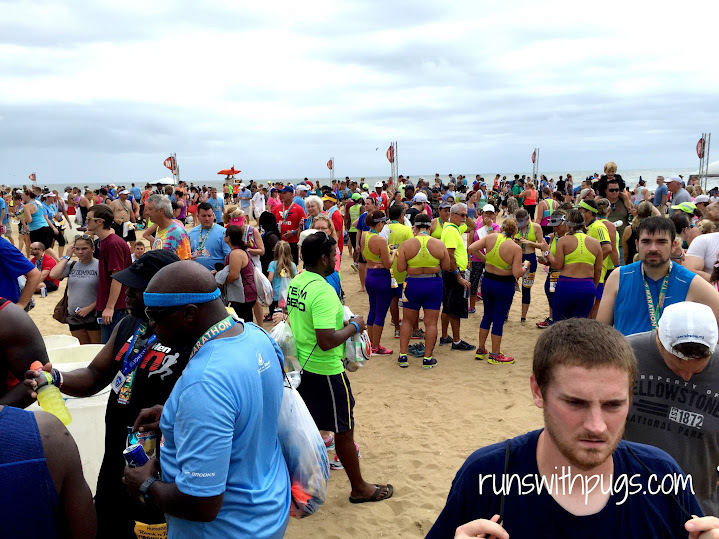 I have run with a few friends, and it’s usually pretty great. I swear, it only went up! I mean I guess at some point it had to go down since we finished where we started… but I don’t remember any of that! I’m running my first RNR in 2 weeks – excited. Congrats to your hubby who stuck it out and finished. So exciting for you! Yeah, he did great! I only wish he had been uninjured so he could have gotten the PR he was after. That’s so great you ran together! Congrats on pushing through a tough race! Thanks, Ange! It went great, considering. Congratulations on you both finishing the race! I love it when my husband runs with me. It makes a difference. We all need that extra push when we want to give up! All that matters is that you finished! You both earned it!!! Thanks! It was fun to run with him. I don’t think we’ll do it too often, but once in a while is nice. Kudos to both you and your hubby for pushing through a difficult race. The crowd support at RnRVB is what always gets me through the race. 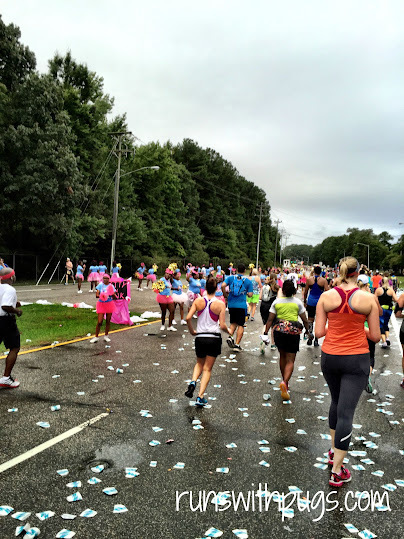 And its funny that you say that the course was hillier than you’re used to, since I always think of Virginia Beach as being super flat, at least compared to where I usually run in Northern Virginia. So my brother-in-law were having quite the debate about the course elevation. You see, there’s “flat” and there’s “Florida flat.” Virginia Beach was on the high end of “flat”, which is hilly when you compare to “Florida flat.” It wasn’t awful, but we are definitely not used to it. Love your report! I haven’t done RnR VA Beach but have done Shamrock Half and Full and it sounds like a similar course. I love that wooded area too, but the military barracks are a little desolate. Still, it’s a great place to race any time of year! 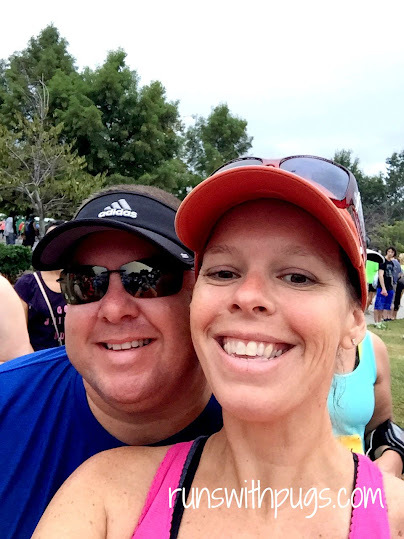 Congrats to your hubby on pushing through in spite of the pain – that takes guts! I’ve heard the Shamrock is awesome! Yes, I remember feeling like that military section would never end. I’ve run on worse stretches, but it was pretty dull in the midst of all the excitement. I was so worried that I’d read one of you dropped out! So glad you both finished. This sounds like one i”d like to do. The Achilles pain does not sound fun! I am glad he was able to finish. 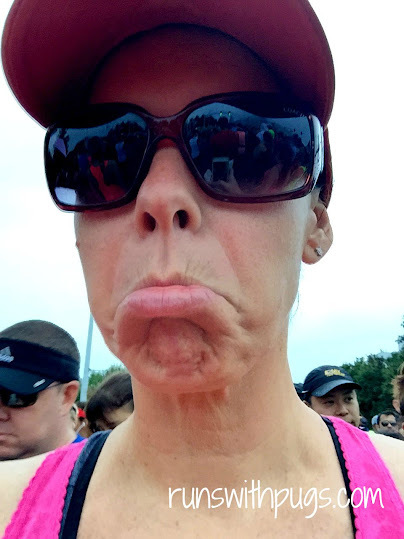 It is tough to push through the pain to finish a race. I seriously considering running Rock n Roll Savannah. It falls on the same weekend as Wine and Dine, but if the rumors are true that Wine and Dine is done next year, I will definitely be registering for Savannah. Wait, what???? That’s the rumor? Sheesh! 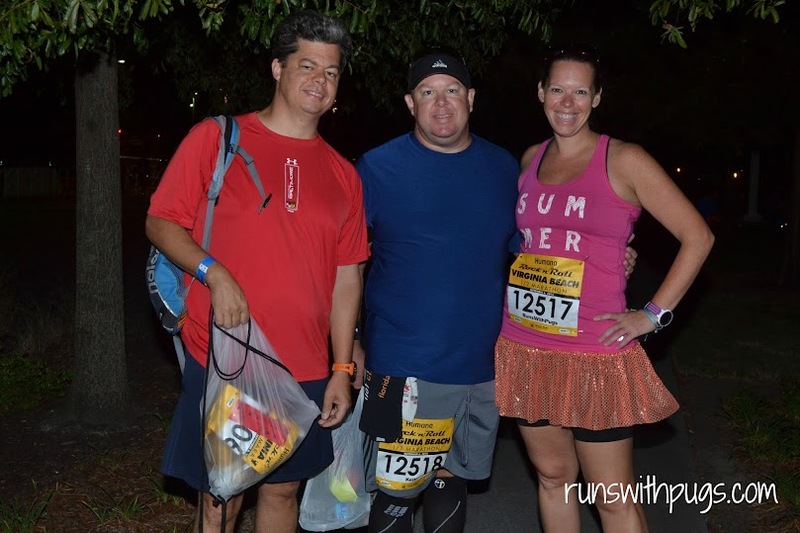 What is runDisney doing? I don’t know if there is any truth to it, but I guess with construction it may stop like Tower of Terror did. I hope it is not true because I love that race. I have actually never run it. Things keep coming up and it never happens. Looks like so much fun. I have always wanted to do a Rock N Roll and haven’t yet- some day. It was awesome. I need to find another one to run! Great recap! I felt like I was there with you. 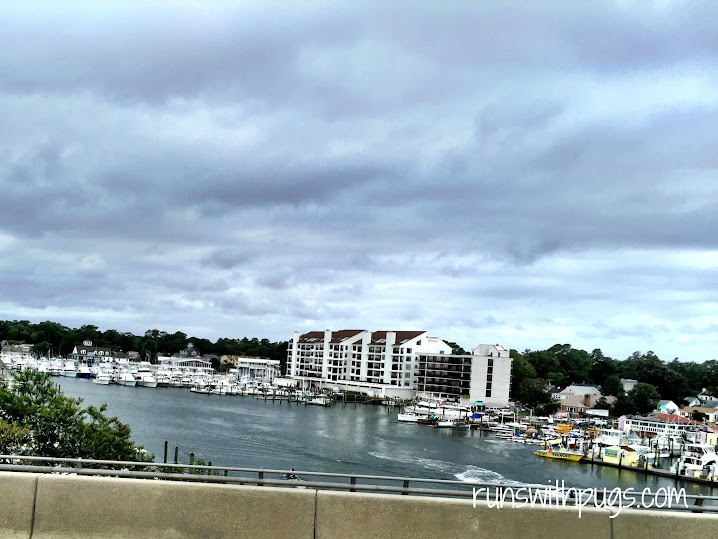 I’ve never been to RNR Virginia Beach but have always heard great things. Hope Mr. Pug Runner’s Achilles feels better! He’s doing ok, thanks. I am trying to get him to do a little more cross training and strengthening, but it’s hard for him to fit it all in. I’ve heard good things about this race. I’ve done a few Rock ‘n’ Roll races and would love to add this one to my calendar. 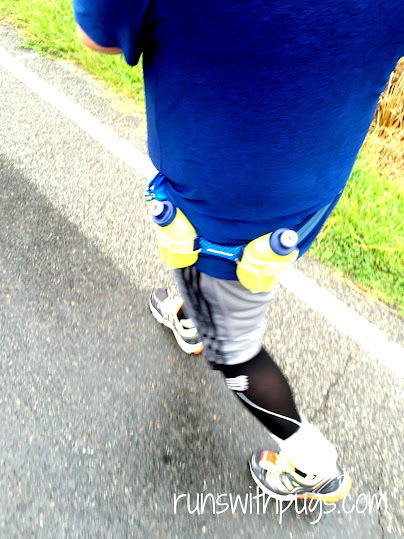 You make such a good point about Biofreeze – I wish aid stations would stock that! I’ve been fortunate not to really need BioFreeze before, but it would have been great for Mr PugRunner, while he was struggling. It’s definitely something for a race of this size to keep in mind for the future. Whoa, tough race. Fun but tough. 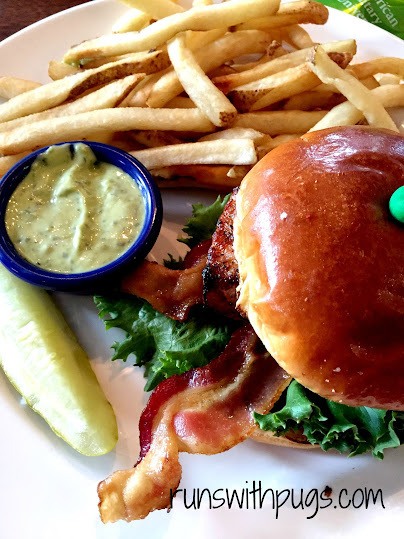 Hope Mr. Pugrunner was feeling better afterwards with the beer and incredibly great-looking burger in the pics. Made me hungry just looking at it. I definitely have to do a Rock n’Roll race at some point in the future. They seem mighty fun. It was tough because of the unexpected injury, but we had a good time regardless. I ate every single thing on the plate, and regret nothing. RnR is definitely a great brand. I am looking forward to trying them out in other parts of the country. Ha ha! Seriously, congrats on a great race – you did it!! Love all your photos! 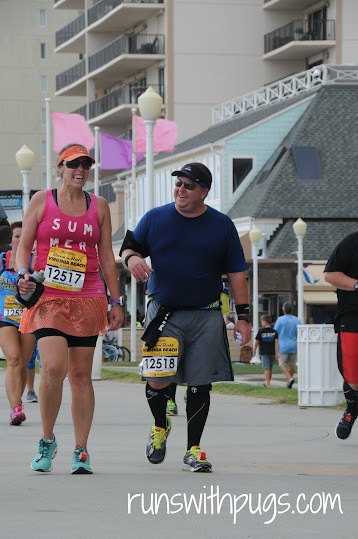 My Aunt and Uncle live in Virginia Beach, so I definitely want to run this race sometime. Natalie recently posted…Weekend Update! 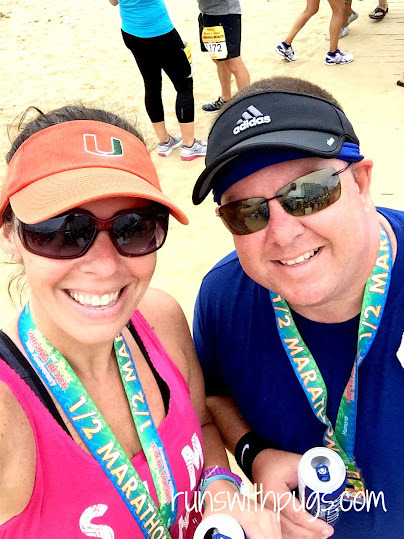 First 5 mile run and other fun tales! If you have family nearby, that makes it even easier! Hope you get there soon! This was not the optimal day for running with the humidity, rain and hot temperature. However, the course is usually well supported with people along the way which as you mentioned, helps alot. Congrats to Mr. Pug Runner on a good finish despite his pain. Getting PR’s at the RnRVB is usually not a possibility because of the heat. I also think the course is quite flat, but I have done quite a few training runs outside of Boston and that area is hilly! It was really nice. 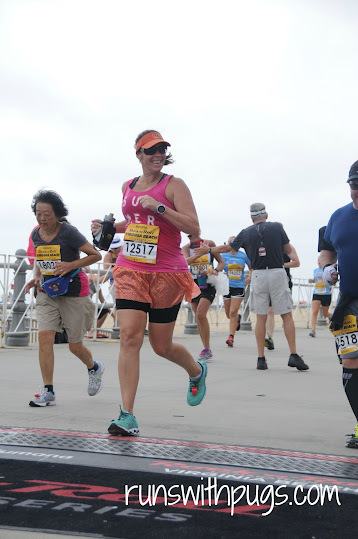 I wasn’t running for any kind of goal, so that made it more enjoyable.